MANILA, Philippines - The Senate Committee on Local Government chaired by Senator Ferdinand "Bongbong" R. Marcos, Jr. on Tuesday approved separate bills seeking the declaration of non-working local holidays in Pasay City, Angeles City, Pampanga, and Surigao Del Norte. Among the bills the committee approved were Senate Bill No. 2412 and House Bill 605, seeking to declare December 2 of every year a special non-working holiday in Pasay City (Foundation Day); House Bill No. 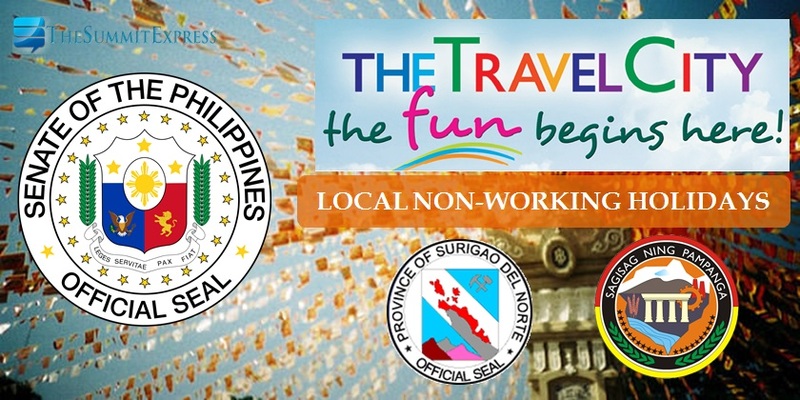 5050 changing the date of a special non-working holiday in the City of Angeles and the province of Pampanga from May 7 to February 19; and House Bill 5860 changing the special non-working holiday in Surigao del Norte from June 10 to May 15. Marcos has been supportive of the policy of the Department of Labor and Employment and employers groups against the declaration of additional non-working holiday because of their adverse effects on workers and businesses in general. However, he noted that the DOLE made no such opposition to the four bills tackled in the committee hearing. In fact, the DOLE even sent a letter to the committee in support of HB 605 and SB 2412, saying there are no palpable adverse effects in observing a non-working holiday in Pasay City. "I think that clearly there are special circumstances in the case of Pasay and the other proposed non-working holidays that is why DOLE has decided that these be allowed," Marcos said in approving the proposals. There were practically no objections too raised to the committee with respect to BH 5050 and HB 5860. Rep. Emi Calixto-Rubiano explained that since majority of the businesses in Pasay is service-oriented, holidays generate even more income for business establishments and workers receive extra income from special pay rates. Both proposals call for a change in the date of the special non-working holidays earlier declared in separate laws passed by Congress. According to the National Historical Commission of the Philippines, such changes are founded on sound historical basis. "I think the hurdles for the declaration of these non-working holidays have been overcome," Marcos said.